The Oakland Raiders (0-2) travel across the country to play the New England Patriots (1-1) for a 1 p.m. start on Sunday in week three of the NFL season. In each of their losses, the Raiders have scored a total of 14 points, as they went down to the New York Jets and the Houston Texans. In week one, New England was surprised by Miami, losing 33-20, while in the second week, the Pats hammered the Vikings 30-7. This is a year when you canâ€™t expect much from Oakland. They have a decent amount of rebuilding to do on offense and need a lot of help in stopping the run on defense. It says something about a NFL team when their quarterback leads the team in passing and rushing. But thatâ€™s the way that it is with the Raiders. 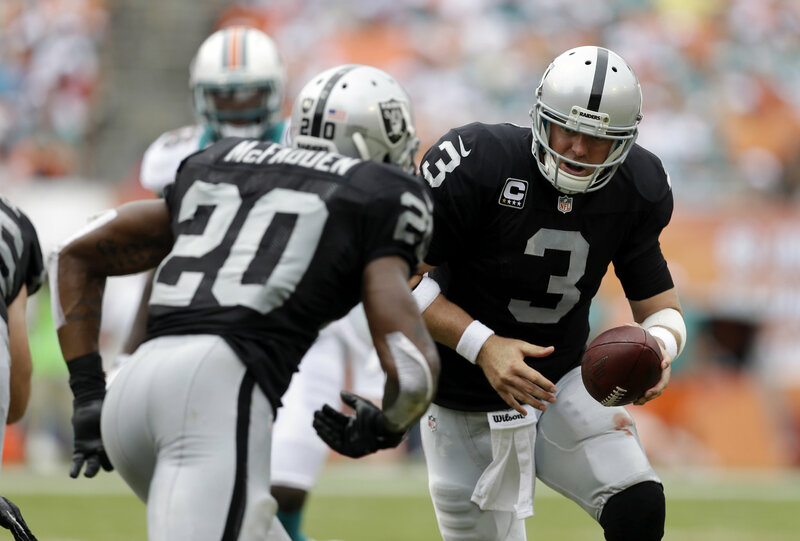 Rookie QB Derek Carr has gained 57 yards in 5 attempts for an average of 11.4 yards per carry. His passing record includes 3 TDs and 2 picks. His top two receivers, James Jones and Mychal Rivera, have more fumbles (4 with 3 lost) than touchdowns (3). There are five players who have double digit tackle numbers, three are linebackers and the other two are in the secondary. This is a team that is solid against the pass (2nd), but they cannot stop the run (32nd). Safety Tyvon Branch leads the team with a total of 19 tackles, while linebacker Sio Moore is second with 18. This looks to be a tough trip for Oakland, a team that has been on a long and winding road in this early part of the season. Perhaps they can beat the Patriots with their defense? Itâ€™s no secret that Tom Brady is getting older. Heâ€™s leading the 27th ranked passing game in the league. The running game at 16th isnâ€™t much better. However, the Pats proved against the Vikings last week that they are capable of putting a lot of points on the scoreboard. Tom Brady is completing just 55.8% of his passes. Thatâ€™s well below what he is capable of, and you should see that percentage rise over the season. This week he goes up against a team that has one thing going for it, pass D. Expect the Pats to wear down Oakland with their running attack, which features Steven Ridley (33 ATT, 122 YDS, 3.5 AVG) and Shane Vereen (13 ATT, 76 YDS, 5.8 AVG). Receiver Julian Edelman (12 rec, 176 YDS, 14.7 YPC) also has 30 yards in three carries. Tight end Rob Gronkowski continues to be a big force as a pass catcher. Each of the four players named has scored a touchdown this season. The New England secondary has improved a lot since last season. The squad has a total of five interceptions. The defense has also made seven sacks. LB Jerod Mayo has notched two sacks and 19 tackles total, while LB Dont’a Hightower, who also has two sacks, has posted nine tackles. Overall, this is a tough defense that can shut down opponents. The Pats play at Gillette Stadium where they rarely lose. If the game comes down to a field goal, placekicker Stephen Gostkowski is five of five with four of those scores coming from between 40 and 49 yards. The Patriots are 15.5-point favorites. From whatâ€™s on paper that may seem right on target. But New England will win by the margin they need to and not according to what handicappers think. Brady may have some problems with the Oakland secondary, but New England has a lot of weapons, and the Raiders cannot defuse them all. Look for a New England win.